This past Saturday afternoon, September 22nd, Rick Ector spoke on the importance of training the increasing number of women desiring to learn how to protect themselves with firearms. Ector started a program to provide free firearm training to Detroit area women when a news story seven years ago recounted the brutal murder of a woman who body was discarded in the street. Ector published a free shooting lesson for in the Detroit area which resulted in 50 women taking advantage of the program. That event has grown every year, In May of this year, 700 women took part in the one day program. Ector wants his program to serve as a national model as to what can be done to empower women against dangerous predators. The 33rd annual Gun Rights Policy Conference was held in suburban Chicago, ILL. 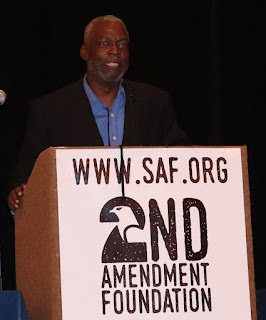 The event featured the finest minds and most active organizations in the country who engage in grassroots gun rights activism in the country. Joining Ector on the segment about minorities in the gun community was Marcus Weldon (The Santa Shooter), Rhonda Ezell (Ezell vs City of Chicago), and Kevin Dixie (No Other Choice Firearms Training). Keep an eye out for the video! It will be published in a few days by Second Amendment Foundation! More info about the 2018Gun Rights Policy Conference can be found here. Update: My speech has been uploaded to Youtube! Watch it now!